The Fettuccine and Porcini Mushroom Pasta Kit is an artisanal pasta kit that makes it really easy to create this tasty dish at home. A lovely gift for every aspiring cook! 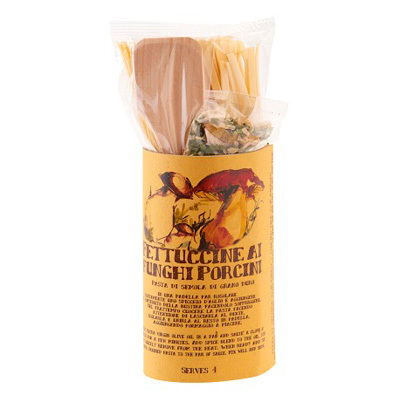 The kit contains fettuccine pasta, a blend of Porcini mushrooms and spices and a handy wooden spoon. An easy recipe for the sauce is also included - all you need to add is a clove of garlic and some extra virgin olive oil. Pasta: Durum wheat semolina, water. Spice mix: Parsley, onion, dried Porcini mushrooms (Boletus Edulis), black pepper, salt.